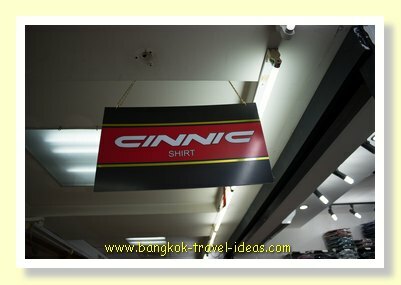 Bangkok shirt shopping can be an exercise in futility if you don't know where to start. 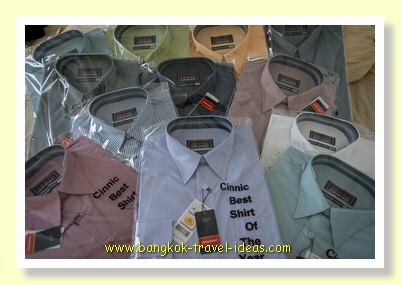 Many years ago I bought enough business shirts in Bangkok to see me to the end of my days, or so I thought. The shirts lasted about five years and then started looking a little worse for wear, so I set out looking for the original store. 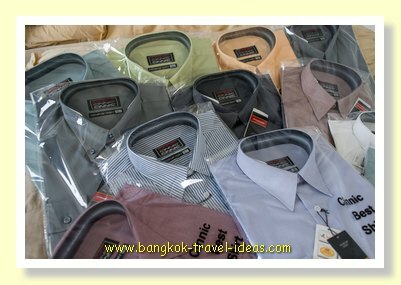 Unfortunately I had cut the neck labels out of all the shirts as they were a little itchy, but I still remembered the brand and the general area of the Bangkok clothing district that I had purchased them. So with an old shirt in a shopping bag and a bottle of water I set out to see what I could find. 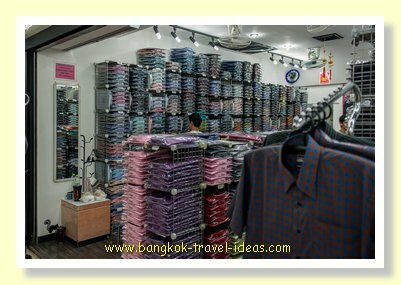 If you know anything about Bangkok shirt shopping then the main garment district of Bangkok is situated in the Pratunam area. This is the place to go if you want underwear, shirts, t-shirts, trousers or ladies wear and there are lots of fashion items on sale also. 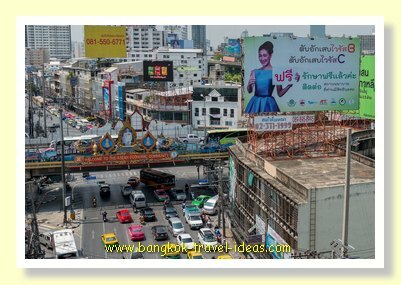 Leave Ratchaprarop ARL station and turn left across the railway crossing. Walk towards the buildings with the golden domes on top. Just on the right is a small Thai noodle shop. 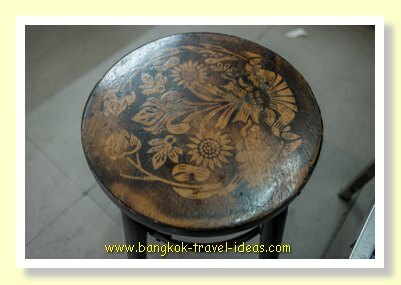 You would probably walk right by and not notice it as it is quite dark and has small tables with little wooden stools to sit on. Call in and grab your self a plate of noodles if it is around lunch time. 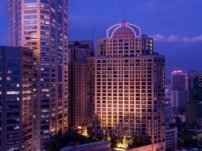 The shopping district is bounded by Pantip Plaza, the Palladium shopping mall and the Baiyoke Sky Hotel and the place just buzzes with action as store men move large garment bags around between the crowds on hand trolleys. Watch out for your ankles as you could get clipped if you don't move out the way quickly enough. With a prime building in mind I went from floor to floor checking each small shop unit until I found just what I was looking for. This one whole shop carried the brand I wanted. It wasn't in the location I was expecting and it all looked different except for the shirts, which were exactly the same. Speaking to the owner of the shop I showed him my example shirt and told him that I wanted another dozen just the same as I had been so satisfied with the quality. The owner told me that the shirts were a copy of his shirt and that his were the originals. I really didn't know what to say, the copy shirts and the apparent originals looked exactly the same design. Anyway he was glad enough to sell me a dozen shirts in various neutral colours. White, grey, blue, pale green and a dark blue had all served me well so I chose the modern variants along those lines, paid the money and set off back to my hotel. 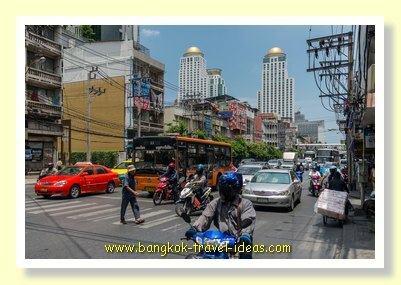 Pratunam is not the best place to get a taxi, so I walked towards Central World Shopping mall where it is easy enough to get a taxi. Back home I kept half the shirts and gave half to my son. Fast forward six years and the exercise of Bangkok shirt shopping played out again. 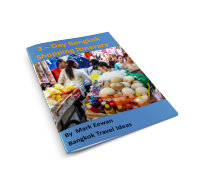 But now, instead of staying in the city I was located out towards Suvarnabhumi airport and having had years of experience with Bangkok shopping I know that taking a car into Bangkok is to be avoided unless you have time to waste. 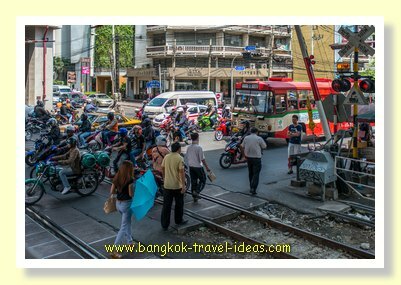 Bangkok traffic can be stopped for twenty minutes whilst some important dignitary is whisked off the expressway or you can arrive at your destination and spend 20 minutes looking for a spot to park the car. The car is not for me any longer. 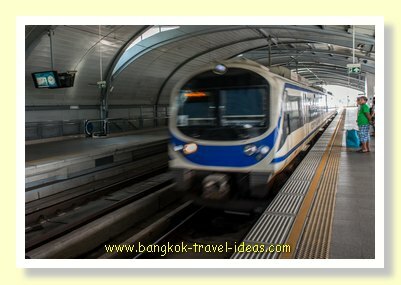 The great thing about Suvarnabhumi Airport is that they also built the Airport Link railway that goes directly from the airport to Ratchaprarop station in the heart of the Pratunam area. 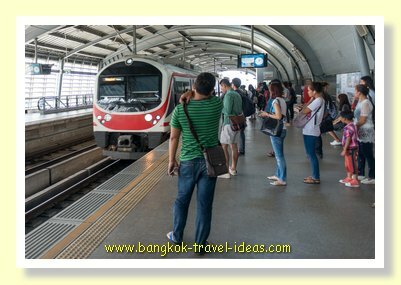 So instead of driving or taking a taxi into town, the preferred method is to go to somewhere like Lad Krabang ARL station and just catch the train from there, direct to the city. The Airport Link uses round tokens similar to the MRT. 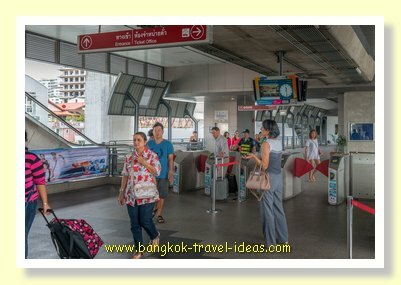 Just purchase the token at the station office, tap it on the turnstile when you enter and just wait for the next train. 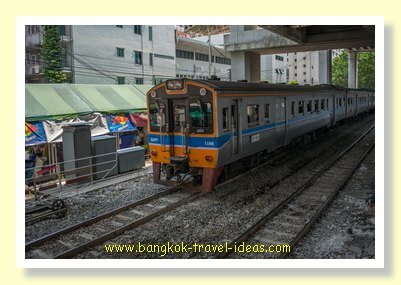 Judging by the number of people on the platform this train is extremely popular for city goers and as you travel along on the elevated railway you get a great view of Bangkok. As we got on the train there were already a lot of travelers direct from the airport with their suitcases and backpacks. The train was standing room only. 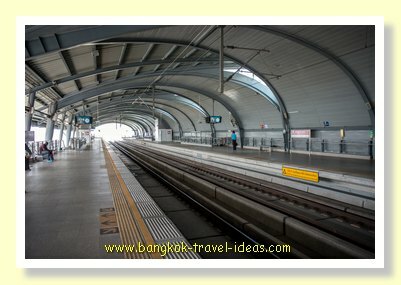 Fortunately the journey to Bangkok city probably only takes 20 minutes and before long we were exiting at Ratchaprarop station. To get out of the station just travel down the escalators to the ground level, turn right across the train tracks and walk towards the two buildings with big golden hemispherical rooflines. 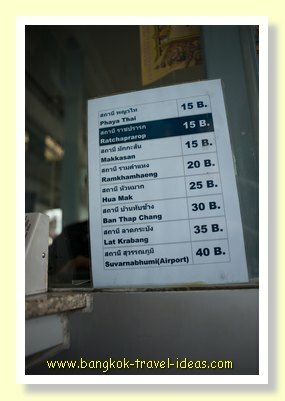 From the level crossing to Pratunam is only about 200 metres and my Bangkok shirt shopping could start in earnest again. As you walk along the pavement you get to weave your way through vendors selling belts, mobile phone cased, handbags and all sorts of hot food. Most of the market stalls have been moved on by the army and it is much easier to walk along the pavement than it was five years ago. I arrived at the correct place and starting at the second level of the building. 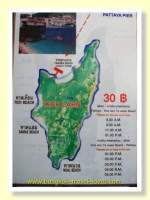 I went to where I thought the shop was located but was out of luck. It looked like he had moved on or else my navigational skills had failed me. A quick check showed me that even his website had gone so I just looked around. Wandering around the same floor I found a different shop selling the same brand of shirt as I had previously purchased. The owner was different and the store name was different and not wanting to buy "copies" I spent a little more time searching the floors above and below to see if I could find the same guy, but he had well and truly gone. After about 20 minutes I gave up and went and purchased another dozen business shirts. This time I ventured to get some stripes, a design that I think is called Paisley design as well as some plain colours. 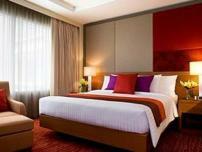 The pricing was much as I remembered it and my Bangkok shirt shopping expedition was concluded. 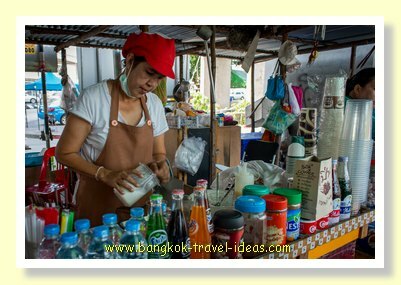 All that was left was to walk back to the train station and travel effortlessly back home and have a refreshing cup of fresh coffee from the coffee stall underneath the station at Lad Krabang. 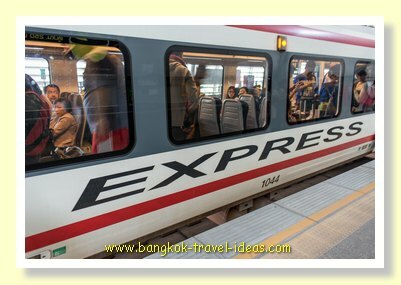 A ticket on the ARL is going to cost about 35 baht into Bangkok and you will arrive at your destination relaxed and refreshed. 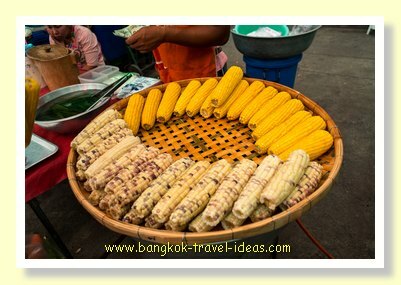 And to really make a day of it, we stopped off at the little market and got some steamed sweet corn on the way home.